Back in 2000 — long before the explosion of Meet Ups, professional networking groups and virtual lawyer affiliations, Long Island based attorney David Abeshouse – then a commercial litigator and ADR practitioner who had just launched his own practice – was searching for substitutes to the collegiality and immediate access to lawyers with different practice areas that he had enjoyed while working at larger law firms. So with a close colleague, Abeshouse devised the concept of the Attorney Roundtable – “something akin to a virtual law firm — an informal but close affiliation of niche practitioners who would provide mutual support and would have no fiduciary duty to refer business to partners practicing in other substantive areas of law.” Sixteen years later, the group continues to thrive — generating business referrals, providing resources that enable participating members to better serve their clients and fostering personal friendships. So why has the Attorney Roundtable — with its “rudimentary website” (as Abeshouse describes it) and modest annual membership fees succeeded while many far more expensive networking groups have not? And what is involved in starting your own networking group? MyShingle is thrilled to host an interview with Attorney RT’s co-founder, David Abeshouse, who addresses these questions and more in this featured interview below. Q. Please tell our readers a little about your law firm – how long have you been practicing law, at what point in your career did you start your firm, and what types of matters does your firm handle? A. I was “born” a commercial litigator. For over 30 years, my practice has been devoted to resolving business-to-business disputes. After stints as a commercial litigation associate at two firms (one on Long Island and one in Manhattan), I went to a medium-sized law firm on Long Island where I became an equity partner a couple of years later. I was at that firm for 14 years, and that was where I first began to develop my interest and experience in Alternative Dispute Resolution (ADR) law – principally arbitration and mediation. I next undertook what was for me a “sea change,” leaving my partnership for a “true solo” practice on my own, with no support staff. 16 years later, my solo practice happily remains just as streamlined, and I am glad not to have to manage and rely upon employees. During that period, I morphed my practice away from court litigation toward an ever-increasing percentage of ADR in the mix, and by 2010, I no longer had any cases in court. My practice now is essentially 100% ADR, and nicely balanced: about half arbitration and half mediation; and about half as a lawyer-advocate representing clients in business arbitration and mediation matters and half as a neutral commercial mediator and arbitrator. I haven’t been to court in about 6 years, and my clients and I are happier for it. Q. As you know, this interview is going to focus on the Attorney Roundtable, a business networking group that you started back in 2000. Before we get to the details of how the group is structured, can you provide a little background on your impetus for starting the Attorney Roundtable? A. When I left the bosom of mother firm in 2000, I realized that as a solo I likely would not have the same collegiality and immediate access to fellow lawyers with diverse practice areas as I’d enjoyed at my law firm. So I started to think about substitutes for that collegiality and access. I conferred with my close friend who also was my CPA – his accounting and consulting practice centered around lawyers (indeed, we’d first met many years earlier when I’d hired him as my financial expert witness for a court trial). There were very few “networking” groups around at the time. I recall vividly that while walking laps together around the large parking lot of our office building at the time, my CPA friend and I came up with the concept of something akin to a virtual law firm — an informal but close affiliation of niche practitioners who would provide mutual support and would have no fiduciary duty to refer business to partners practicing in other substantive areas of law. He and I would create and be the “hubs” of this brand new wheel; and we’d invite other “spokes” to occupy unique spots. It would be ideal for him to be at the center of a group of his target audience, and it would be excellent for me, partly to “replace” my former partners, to generate new sources of business, to have a close network of legal professionals who could rely upon each other, and to create social opportunities as well. The two of us structured the group (e.g., designed rules, criteria, and policies), invited the first several members, and made all the agenda and venue arrangements for meetings. So the Attorney RoundTable (ART) legal networking group was born. Q. Can you tell us how the Attorney Roundtable is structured, whether there is a fee to join, and how many members you currently have? And has the group always been the same size and structure, or has it evolved and grown over time? A. For the first half dozen or so years, ART followed the now-familiar one-person-per-area of law practice model. Then, shockingly, my CPA friend passed away suddenly. We suspended ART meetings for several months of mourning the loss of our dear friend and colleague. Then, slowly, group members began to inquire whether we would re-start the group. I agreed to do so, but upon certain conditions, the main ones among which were that: We would elect an Executive Committee of five members to assist in the running of the group so that I would not have to do it all; we would form several other committees to help organize and run the group (e.g., Programming Committee, Membership Committee, Financial Committee, etc. ); and the group would be open-minded about a change that I wanted to effect – shifting the group from the one-person-per-area of law practice model to an up-to-two-people-per-area of practice, or what I called my “Noah’s Ark Model.” This unique model creates both competition and collegiality, enhances attendance at meetings, and sets ART apart from other legal networking groups. All these changes took effect over a relatively short period of time. The Executive Committee (elected every two years) wrote up guidelines and policies for the group (which have been modified from time to time) – the current version is posted on the second page of our rudimentary website that I (under the glorified title of “Luddite Webmaster”) struggled to create and struggle to manage. See: www.AttorneyRT.com Dues cover costs for all of our regular (agenda-based) dinner meetings and social (cocktail hour) meetings, as well as any other expenses the group may incur (e.g., we’ve done a bit of advertising on one or two occasions). Our dinner meetings typically are conducted in private dining rooms of nice restaurants in Nassau County, Long Island, and our social meetings are cocktail and hors d’oeuvres events in similar settings (as well as our annual summer BBQ at the residence of one of the members – spouses and significant others are invited to this, and they’ve also formed bonds over the years), although we have also done social gatherings at baseball stadiums and other venues. Semi-annual dues usually are $300, but the ART Executive Committee has exercised its discretion to decrease those dues when our Treasury is sufficiently full. $600 per year is a very modest cost in this high-priced area of the country, particularly considering what members receive in return. We always seem to have around 30 members these days. We don’t want to go much higher than that, as it gets unwieldy. Q. Tell us a little about the selection criteria for Attorney Roundtable members. 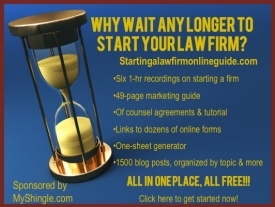 Is it limited to attorneys, or may vendors or paralegals join? Well-defined principal substantive area of law practice for practicing attorneys; focus or concentration in that one niche area, greater than 50% of individual’s practice and that of firm; no more than two members per law practice area (“Noah’s Ark” competitive model: two-by-two) in the group; approval by group membership (individual member veto power: Two vetoes results in denial of membership to prospect). Two applicants vying for one available slot are to be determined by group vote, with majority prevailing. Senior in-house corporate legal counsel welcomed; lawyer-owners of legally-related businesses benefitting lawyers are considered on a restrictive case-by-case basis (e.g., must have minimum 3 years’ experience in this business). For practicing lawyers: At least seven years of law practice experience in that principal area of law practice. Ownership of practice/owner-officer-senior manager of corporation. Office location in, and more than 50% of practice based in, any or all of the 8 counties comprising Long Island, New York City, and Westchester. Clear commitment to participate actively in the Attorney Round Table: regular attendance at meetings and events, with an aspirational goal of missing no more than two meetings each year (i.e., attendance at 8 of the 10 monthly meetings annually); RSVP-ing promptly by e-mail in advance regarding attendance at meetings; service on a committee and other appropriate functions; interaction with other Attorney Round Table members in between meetings; bringing to the group at least one new visitor (qualified prospective member) per year; remaining current with timely payment of semi-annual dues and any assessments. Q. Have there ever been disagreements over whether someone should be permitted to join – and how are they resolved? A. Yes, but if I tell you the details, I’ll have to ensure that you’ll never be able to testify…. Seriously, we do have a process, and it has worked well. A prospective member fills out the application on the second page of the website, and submits it to the Membership Committee chairs. If approved (meeting the basic criteria delineated on the website), the prospect gets to visit for 2 meetings (paying a flat $50 visiting fee to cover dinner or social meeting costs). (S)he is encouraged to get to speak with members during the meetings, so we all can see if there’s a potential match there, and also ascertain whether there are any disqualifying factors. If after the 2 visits the prospect indicates a desire to join, the Membership Committee sends out a notice to all members asking whether there’s any “veto” of the prospect. A veto only can be for legitimate reasons (failure to meet stated criteria, demonstrable reputational negatives, etc.) but not merely because that prospect competes with a member, when there’s an open slot. Two vetoes results in denial of membership. Q. I noticed that the Attorney Roundtable is limited to attorneys with seven or more years of experience. Why did you decide on this requirement, and have you ever been approached by younger lawyers who wanted to join the group? A. Seven years represents the first stage at which most law firms begin to consider lawyers for partnership. Most areas of law practice take years of experience to master. Frankly, ART is not a group for neophytes; rather, we seek only individuals with sufficient gravitas and experience to be able to participate meaningfully in the exchange of referred business as well as mutual support (on issues of law practice management, substantive areas of the law in which other members do not practice, etc.). On the rare occasions when we have been approached by younger lawyers interested in the group, they have been sent back to their nurseries to mature and grow (seriously, we have allowed a less experienced associate of a member to attend a meeting now and then in substitution for the law firm owner, so we’re not completely ageist). Q. What types of activities and events has the Attorney Roundtable organized? A. The bulk of our activities are our 10 or 11 meetings annually (most are agenda-based dinner meetings, and we have one “social” meeting each season). But members also have formed foursomes for golf, and have participated in each other’s charity events over a wide spectrum. As a group, we arranged a cocktail party “mixer” with a somewhat similar group of lawyers in Manhattan several years ago, and we held our ART 15thAnniversary Gala, with spouses and significant others, at a beach hotel roof deck in June 2015. Q. All of this seems like a lot of work. Do you plan all of the events and oversee member selection or do others help out? And how much time was involved in getting the group off the ground, and continuing to operate it over the past 16 years? A. As noted earlier, it’s not a one-person job. In the early years, my CPA friend, his staff, and I ran things. After he tragically passed about a decade ago, I realized I could not run it myself, and as mentioned, conditioned my continuation of the group upon committee assistance in managing it. It’s worked like a charm since then, for the most part (there’s always the occasional exception to every general rule, but I’m happy to report that they indeed have been only occasional). Our Program Committee does a great job planning the agendas for our dinner meetings. Sometimes there’s a “spotlight presentation” for 15 – 20 minutes by a new member; sometimes there’s a presentation by a member either on a particular area of law practice (or practice management, such as the talk I gave several years ago on “LinkedIn for Lawyers”); sometimes there’s a competitive trivia game with valuable prizes for the winning table; sometimes there’s a group discussion topic (which might be humorous, legal, personal, or anything else that the Program Committee approves). Some examples of recent discussion topics include: “What drives you crazy? Vent your frustrations from the law and everyday life”; “Employer-employee issues”; “Collecting your fees (retaining liens, stopping work, suing)”; “There ought to be a law”; “Considerations when taking in a new client”; “Things we like to do locally in summer”; “Immigration update”; and so on. Probably around half a dozen or so years ago, the Executive Committee decided to circulate to the membership a survey of approximately 30 substantive questions. The responses (which were surprisingly voluminous, reflecting our members’ commitment to maintaining and improving the group), while ranging all over the map in many respects, were almost unanimous on one regard: Everyone wanted a permanent ban on outside speakers. It seems that no matter how clearly I had warned outside speakers to be sure to be “telling, not selling,” they all-too-often violated that principle, to the angst of our membership. So, we haven’t had an outside speaker in years. Insular? Perhaps. But it’s worked well, and has helped us to get to know each other better, through our internal presentations and discussions. The Executive Committee, on which I still serve, continues to have managerial input into all aspects of the group. Each committee has at least one liaison member who also serves on the Executive Committee, and identifies issues to be brought to us. Also, in my capacity as “Luddite Webmaster,” I get to see what is submitted to me for posting on the website, and I can triage any questionable items. Recently, for example, a group discussion topic had to be “toned down” because in its original form, it was deemed unnecessarily inflammatory and political, and we saw that our group of colleagues might have their dinner ruined were the topic to be presented as such. The alternate version proved quite successful. I know that I personally have spent countless hours working on the group over the years, as have the various members who’ve served in the Executive Committee. But it’s all been worth it, not only for the business referrals realized, but also for all of the other benefits conferred, which leads us to the next question and answer. Q. What are some of the benefits of joining the Attorney Roundtable? A. Perhaps the best way to answer this is to refer the reader to the ART website’s “Testimonials” page. A handful of years ago, I solicited testimonials from the group, and posted them on this page. Here, members express, in their own words, their thoughts about the benefits of the group. I commend to you a reading of their sentiments. But I’ll cull here a list of the main benefits from those testimonials: strong mutual support from friends and colleagues, assisting each other by discussing issues of law practice management, referring clients to members in other niche areas of practice providing information about our areas of expertise to those practicing in other niches, co-counseling on appropriate matters, social opportunities, it’s cost-effective and time efficient, builds one’s contact list of quality attorneys, an indispensable professional resource, colleagues available to brainstorm current legal issues, ability to call on the expertise of so many top attorneys in their respective fields, members stand ready to help each other with answers to questions and guidance or problem-solving, forming close friendships, an indispensable resource for our clients, one-stop-shopping for clients’ legal needs, confidence in being able to refer clients to group members with expertise, group discussions help us learn about issues common to all of us, a resource for clients who call with needs outside our particular realm, wonderful friendships that have developed, looking forward to the monthly meetings, expands the resources of solo and small firm practitioners, assistance is just a phone call or e-mail away, making referrals with confidence, and more. Q. Can you share one or two Attorney Roundtable “success stories” that stand out in your mind? A. There have been literally hundreds of success stories in ART over the past 16 years. One element of our regular agenda-based dinner meetings is our “Thank-Yous” segment. Members thank each other briefly but publicly for referrals of business, assistance in matters where there were needs outside their expertise, invitations to dine or socialize, help provided to a family member, and a welter of other items. Often, this segment of the meeting takes quite an appreciable period to complete, as there are so many reasons to thank each other at each dinner meeting. Those of us who don’t trust our aging memories to be complete tend to write lists of whom to thank and for what, before these meetings. That, in and of itself, is perhaps the greatest ART success story. But I’ll provide one quick specific personal example: Several years ago, a corporate client contacted me on a Saturday, saying that he’d just received notice the previous day of a significant liability alleged by the NY State Workers’ Compensation Board (I believe it had to do with alleged failure to pay required premiums), and it threatened the future of his struggling small business in the arts. Background fact: What I know about Workers’ Comp you can put in a thimble, and still have room left over. So, I immediately e-mailed the person who back then was our WC member, and set out the issues for him. That afternoon (still on Saturday), he wrote me back an e-mail laying out step-by-step what I had to do to take care of the issue, and then he called me to walk me through the process (and told me that if I experienced any complications, he’d be happy to get involved). I informed the client that he could sleep well over the weekend, and that by Monday we should have the process of resolving this well under way. Monday morning, I contacted the WC Board, did everything my colleague prescribed, and got a very significant liability reduced to zero. I told my client, who was overjoyed and thought I was a miracle worker (I told him that I had friends who were miracle workers), and then let my WC colleague know the good news, and also that my client wanted to pay him several thousand dollars for his expert advice. He turned it down, saying it was his pleasure, and that we simply should think of him for the next opportunity – and that’s how these sorts of things tend to get handled at ART. Q. To me, what is most remarkable about the Attorney Roundtable is its longevity. What in your opinion accounts for that, and where do you see the group heading in the future? A. That’s hard to say. I’d like to think it’s the brilliance of the Executive Committee, but no one will buy that, plus it’s hard to replicate our intrepid committee of five. I do think it’s partly due to our willingness to morph and change over time, trying out some new things, discarding some, modifying others. It also is partly due to our clear structure, criteria, and guidelines – they attract some, and repel others, which is perfect for us. This means we tend to attract those who are generally like-minded, at least as to the structural outlines of the group. We’ve maintained quality standards by strictly adhering to our stated criteria, and we’ve devised a methodology that, while a bit cumbersome for the Executive Committee (and in particular one volunteer member), encourages active participation and attendance among the membership (see description of our “Associate Membership Policy” on the second page of the ART website). We’re also willing to listen to suggestions from members about ways in which to enhance the ART experience. I regularly solicit input from members (both in person and by e-mail), exhorting them to come up with good new ideas for the group. Our mutual commitment to ART is infectious – we each encourage each other to be active in and to improve the group. S0 the future is bright, along a path we’ve carved over the past 16 years, with some twists and turns, which is largely what keeps us vibrant. Q. Many of the Attorney Roundtable activities that you described take place in person. Do you think that a similar group can be replicated online, or do you believe that in-person events are important? A. Yes, in part; and no, in part. I think that while much can be done online, an exclusively online group misses out on some of the benefits of a group that in-person networking bestows. It’s similar to the situation in which a friend of mine started a general business networking group that originally was exclusively online and by phone. Networking meetings initially were conducted by telephone conference call supplemented by e-mail; these were further supplemented by the group listserv and website. After a year or two, however, the members began to tell the founder of the group that they’d like to meet in person all of these great folks they were meeting virtually. Fast forward a few more years, and now her group (consisting of several hundred members) is fully integrated online, by phone (morning, noon, or night), by listserv, and with multiple in-person opportunities in NY City and on Long Island, including breakfast meetings (some of which are BYO, to reduce costs); lunch meetings (some BYO); dinner meetings; cocktail parties; bar crawls; small-group dinners; museum gatherings; and outdoor art treks, among others, and her network has grown significantly. I also belong to another networking group that is in many ways similar to ART but is a few years younger and much larger (indeed, international in scope: the INBLF – (International Network of Boutique Law Firms), and has both online and in-person components. I don’t think it’d be successful without either one of these modalities. What is striking about INBLF (among other things) is how well it gathers its members together for in-person events among its far-flung adherents on many continents. Were someone to try to replicate ART but do it only online, I do think that much of the collegiality and trust that’s built up through face-to-face meetings would be missing. As much as we’re all about electronics these days, fundamentally we’re still human, and require direct interpersonal contact to form strong bonds. Q. Do you see the Attorney Roundtable as replacing either bar association networking events or professional marketing consultant programs? A. No, I see each of these as a supplement to, rather than a replacement for, the others. They all serve somewhat different functions, in somewhat different contexts. ART has about 30 members; my local bar association (the Nassau County Bar Association) has about 5,500. They don’t compare in terms of breadth/reach and intimacy. Professional marketing consultants typically target your firm and your issues to enhance your practice in a focused way, at least from the perspective of the consultant. ART’s discussion topics are a bit more general, but we do focus in on particular issues when a member brings them to the table, and (s)he gets the benefit of multiple perspectives. Q. What advice do you have for readers who may be inspired by your experience with the Attorney Roundtable and would like to start a similar group in their community? A. Nowadays there are many networking groups. If you want to form a group that will attract people, you need to have clearly stated goals and the mechanisms in place to achieve them. You also should have some differentiating factor setting your nascent group apart from all (or most) others. Our Noah’s Ark model is one such factor; there could be many others. Do what comes naturally to you – don’t try to force the proverbial round peg through the square hole. And feel free to crib from the ideas described above and on ART’s website. We’re a transparent organization, and I’ve put it out there for the world to see, if they’re interested, and – as long as you don’t use a confusingly similar name – we’re happy if you create your own group, whether similar to or different from ART. Indeed, several years ago, a couple of friends of mine in Nassau County came to me, saying they intended to start a lawyers’ networking group, and wanted to (a) ensure they didn’t step on ART’s toes (one of them was a member of ART), and (b) pick my brain about the pitfalls and problems in starting a networking group. Their intended model was quite different, but no less valid: They sought to grow larger than ART, did not plan on monitoring attendance, had fewer criteria and guidelines, and planned periodic large public events. I was happy to discuss with them some hints and pointers, and was glad they decided to use a dissimilar name for their new group. Both groups peacefully coexist today, and there are several lawyers who are members of both, for the different benefits they confer. A. Only that it takes a consistent commitment to organize and run an effective group. Periodic e-mails must be sent; the website must be updated with new info; group spirit and morale must be stimulated; and the organization has to be willing to morph with the times. I appreciate when our members are willing to submit to me for posting on the Member News & Events page of our website their awards, speaking engagements, writing for publication, events, and other accomplishments, so that their colleagues can know what they involve themselves in on a regular basis. It’s great when they send me info to update their contact information and practice descriptions on our Members page. But the best is seeing how actively engaged they are at meetings (we always have a task ahead of us at regular dinner meetings trying to move the assembled masses away from the conversational cocktail hour and into the dinner and agenda portion of the meeting), and how telling those “Thank-Yous” are, in the agenda part of the meetings. There’s a lot going on at meetings, and in between meetings. This is how networking is supposed to work. I hope it continues long into the future for our ART-ists.